The Cat's Claws: Mellow Yellow! Having The Little People to stay has been very hard on my nails- so that flaw that you can see on my middle nail, is in fact a broken nail. I decided to quickly take some photos whilst I still had them, so I'm afraid these are indoor photos shot in haste. 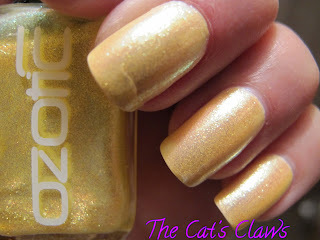 My apologies in advance, but Ozotic Pro 904 the yellow colour is a surprise winner of the Sugar series. I thought I would hate it but even before the brush touched my nails I was mesmerised by the sheer gorgeousness of the colour! And my mani was the most talked about this week too! Catching so many compliments from the guys as well as the girls. So on to my mani, three coats of Nubar Yellow Primrose a pale creamy yellow from the Nubar Spring Garden Collection 2011. Two coats of Ozotic Pro 904 a lovely bright clear yellow jam packed with ultra reflective glass flecks. One coat of Seche Vite followed by Ozotic Pro 904.